“I don’t need a hard disk in my computer if I can get to the server faster,” said Steve Jobs in 1997. This has come true and the time is not far when entire businesses are going to be run from the cloud. Businesses will also use the other arms of the Nexus of Forces – social, mobile, and analytics – to drive employee productivity and deepen customer relationships in the next few years. But a day will come when this will not be enough to compete. Companies will need to use the Internet of Things (IoT) to build innovative business models with smart machines. By 2020, there will be over 30 billion devices wirelessly connected to the IoT. 1. Make IT a profit centre: The main role of IT is not to maintain the existing systems but to transform the organisation. This can happen only if it becomes a profit centre. Every successful brand makes certain promises to its customers. The IT team must deliver on its promises every time. The IT service catalogue, which is nothing but these promises documented, must be developed as a means to build brand equity. Moreover, the IT team must always work towards customer-specific goals. The IT team must also work fast and project deadlines must be measured in days, not months. 2. Show the ROI: The benefits (and costs) of IT projects must be quantified, and a business case must be presented before getting the go-ahead for the investment. The indirect gains due to increases in employee productivity, customer satisfaction, and collaboration must also be estimated while calculating the ROI. No company can invest in every new technology. Calculating the ROI and comparing it to the required rate of return will enable IT leaders to make the right investment choices. This will also enable IT leaders to derive the best value out of their limited budgets. 3. Strategise with other executives: IT leaders must collaborate with top executives, analyse market data and trends, and strategise for the future. This will allow different organisational functions to work towards common business goals. If IT leaders are part of the team that discusses the strategic course of a company, they will spend most of their time implementing technologies that will make the biggest difference. 4. Make IT a culture: The culture of IT must be ingrained into every employee of the company. A monthly newsletter that lets the entire organisation know how IT is positively impacting business can do wonders. This will ensure that IT is rightly perceived as the heart of the company. Over time, IT will be able to build stronger and mutually enriching relationships with other functions. In the process, the IT team will be motivated to work harder and to make technology work for the company. 5. Use SMAC: Only 36% of small businesses, 48% of medium businesses and 77% of large businesses have a social media presence, according to a report by Yellow Pages. This is a big opportunity for companies especially since 69% of Australians use social media to research products they want to buy. There is also a huge opportunity for Australian companies to increase their productivity by adopting Bring Your Own Device (BYOD). Only 50% of Australian organisations used BYOD at the end of last year and this is far lesser than adoption rates in other developed economies. The right analytics tool can increase operating margin by as much as 60%. The cloud can enable a company to increase its gross profit by up to 2.5 times more than its competitors. In the future, IT leaders should use these technologies not separately but as a single nexus of forces to gain competitive advantages. 6. Build a digital business roadmap: IT leaders must understand their company’s position on the digital business development path. It is only after this that they can identify the right technologies for revenue growth. Infrastructure planning must start well in advance for companies to build fully autonomous systems. Fully autonomous systems will be commonplace by 2020 and IT leaders must be ready for both the technological and cultural change they will bring about. In the coming years, it will be necessary for IT to stay ahead of business demands to win against competition. IT leaders will need to know the pulse of the customers at every point in time. In this way, business value can be maximised and your company can achieve its true potential. 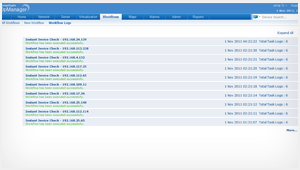 OpManager Free Edition utk monitoring jaringan Anda. After downloading OpManager Free Edition online and installing it on your machine, inform the Setup wizard that you want the Free Edition. Otherwise, it defaults to a 30-day trial version. 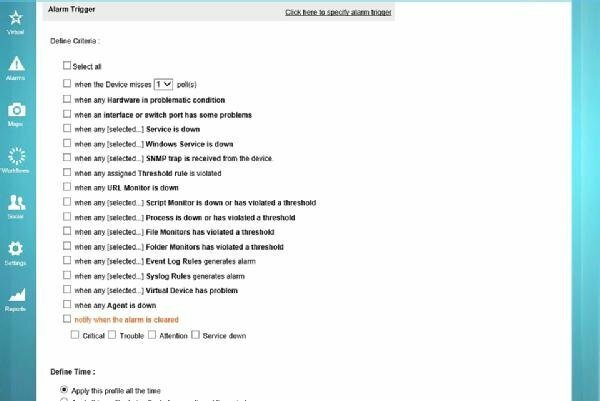 Next, choose the devices you want to monitor. To do this, enter an IP address (or an IP address range) and a set of credentials. OpManager uses authentication credentials -- ones not requiring agents -- to connect to monitored devices. The software supports the use of SNMP (versions 1, 2, and 3), Windows/WMI, Telnet/SSH, and VMware. Figure 1 shows a breakdown of CPU and memory use across monitored devices. Figure 1. OpManager provides resource utilization data. One useful thing about the monitoring data OpManager provides is that ManageEngine provides the tools needed to make the data available from outside the OpManager console. In Figure 2, OpManager provides a block of HTML code that corresponds to the top 10 CPU utilization data. You can embed this code into a SharePoint site or any other website to access monitoring data outside of the OpManager console. Figure 2. OpManager provides you with code to display monitoring data on a website of your choosing. In addition to statistics, OpManager also has a robust workflow engine. Admins can manually run workflows, or they can set them to respond to an alarm or run on a specific schedule. For example, a workflow might launch when a process stops or has violated a threshold requirement. Figure 3 shows some of the available triggers. Figure 3. 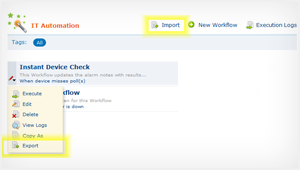 Workflows can be executed in response to a number of different conditions. 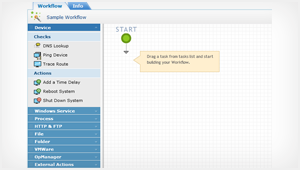 Workflows are easy to build and are flexible. OpManager uses a Visio-style interface that lets an administrator drag and drop various actions and conditions to a workspace. Actions are divided into categories. For example, there are actions related to devices, Windows services, processes, HTTP and FTP, files, folders, VMware, and OpManager. Figure 4 shows the workflow construction process. Figure 4. OpManager also has a decent reporting engine. Many of the built-in reports display the same types of information you can view through various dashboards, but the software allows you build your own reports. The reporting engine is shown in Figure 5. Figure 5. OpManager has a built-in reporting engine. In late 2014, I took a moment to think about a few trends enterprise IT should expect to see for 2015. I’d like to explore these trends a little further. 2015 will see continued development of SDN technologies, and buyer confusion will not abate as the incumbent switch and router vendors jockey for position. But NFV, already being widely deployed into service providers, will make its way into “classical” enterprise networks without the need for any SDN refresh (which, curiously, may require new hardware). Virtualized network functions allow organizations to dynamically provision networks wherever they’re needed, on an on-demand basis, independent of any underlying fabric. While SDN continues to attract much attention, actual enterprise deployment remains low. Like “cloud,” “SDN” has been defined and redefined in various ways, often to advance particular agendas. This leaves potential buyers with a challenge to justify the costs and disruptions that an SDN deployment typically incurs. Fortunately, the path toward NFV is much clearer. Modern general-purpose CPUs provide equivalent or better performance than custom hardware, and software can now replace nearly every “middle box” that sits somewhere in a network. Originally of interest mostly to service providers, NFV allows enterprises to separate network functions from location, allowing applications and data to be “projected” wherever and whenever needed. Unfortunately, the relentless pace of data breaches in 2014 will continue in 2015. Traditional security tactics, such as relying on “hardened” perimeters and rigid mobile device management, will have little effect at slowing down the bad guys. Enterprises should shift investments and spend more on detection and response. Visibility across all applications, networks, and devices is the first critical step toward improving overall security postures. Establishing a baseline of what’s “normal” helps to better isolate actual threats and respond accordingly. The high profile attacks of 2014 completely evaded perimeter-style security controls. Attacks that target people—always more vulnerable than technology—will remain in the headlines well beyond 2015. Despite this, security budgets won’t grow much, because demonstrating ROI on security investments can be a futile exercise (“How much money did we make with that firewall again?”). Now is the time to reallocate budgets to be better prepared for when the inevitable happens. Improved detection capabilities can help limit how far an attacker might penetrate a network. A well-tuned (and practiced) response process guides the organization to recover quickly in a controlled fashion, minimizing errors and omissions and returning to profitability as soon as possible. Even though cloud computing and third party hosting will continue their rapid expansion, on-premises IT will remain a reality for 2015 and beyond. The resulting hybrid infrastructure stack will create challenges for most organizations—including architectural “collisions,” where design patterns for on-premises development and deployment don’t translate well (or at all) into cloud. Working through these challenges will require more sophisticated models, policies, identity/access controls, and coding practices to ensure that end-user needs are met consistently across all platforms. Immediacy is the theme. The dynamic nature of modern business requires that IT develop skills and methods for providing effective solutions quickly. Agile development methods, modeling and simulation tools, and a devops philosophy all can help an organization outflank and beat its competition. Software that offers abstraction layers for common tasks such as authentication/authorization, interprocess communication, and service chaining can help reduce dependencies on particular deployment architectures, making it easier to move application stacks across platforms. As visibility, control, and optimization are brought to hybrid networks it will become increasingly important to construct an analytics-driven infrastructure that can take action when problems occur anywhere in the network. In 2015, more IT organizations will begin instrumenting network architectures with predictive analytics to create self-correcting, self-generating networks that respond to business needs and intents. This will be an ongoing trend starting in 2015. Well-instrumented infrastructures provide the foundation for introducing automation. Such automation helps infrastructures react to changing demands without requiring manual intervention (and also reduce errors that might occur whenever humans touch technology). Visibility tools can help to discover and map dependencies in application workloads, a necessary element for true workload portability. Furthermore, rich analytics supports the recommended shifts in security techniques toward detection and response. The technologies that will emerge in 2015—full stack virtualization, pervasive visibility, and hybrid deployments—create a form of infrastructure mobility that allows organizations to optimize for location of data, applications, and people. Regulatory policies that govern data locations will cease to become an impediment, and rapid access to that data will become possible for anyone, regardless of where they may happen to reside. Organizations that adopt these technologies will achieve new kinds of competitive advantages as a result. The industry is at the threshold of a significant change—a change that is poised to eliminate this constraint from most decisions. With the help of modern tools designed for such purpose, IT organizations can liberate themselves from the limits of distance and location. Applications and data can be placed wherever is optimal for the business and can be quickly moved around as necessary. Users will have a consistent performance experience. Administrators and developers can retain visibility into application behavior regardless of how much distance might separate users from their data. Network professionals must support an increasing number of technologies and services. With adoption of software-defined networking and network function virtualization, troubleshooting becomes more complex. NPMD tools help detect application issues, identify root causes and perform capacity planning. Network performance monitoring and diagnostics (NPMD) enable network professionals to understand the performance of applications and infrastructure components via network instrumentation. Other users and use cases exist, especially because these tools provide insight into the quality of the end-user experience. The goal of NPMD products is not only to monitor the network components to facilitate outage and degradation resolution, but also to identify performance optimization opportunities. This is conducted via diagnostics, analytics and debugging capabilities to complement additional monitoring of today's complex IT environments. At an estimated $1 billion, the NPMD market is a fast-growing segment of the larger network management space ($1.8 billion in 2012), and overlaps slightly with aspects of the application performance monitoring (APM) space ($2 billion in 2012). AppNeta offers the only dedicated SaaS solution in this research for NPMD purposes. AppNeta is one of a select few vendors that are bridging both APM and NPMD use cases, but on a different path, converging these two offerings to build complementary technologies between both offerings. The offering consists of PathView 7.2, providing multiple deployment options for the on-premises component of the solution (including software, virtual appliances and/or hardware appliances). The solution includes deep packet inspection capabilities in most form factors and also includes flow ingestion. The product has voice analysis capabilities, and the unique path mapping and diagnostics capabilities useful for troubleshooting. AppNeta has a completely Web-based user interface, and packets can be stored based on criteria matching. The appliances hold data for up to 24 hours, based on the available storage, if the service disconnects. AppNeta's products are low cost and paid via monthly subscription, making them suitable for large distributed environments, which need some level of packet visibility. Multiple form factors and plug-and-play deployment make this one of the simplest solutions to maintain day-to-day. AppNeta delivers both APM and network performance monitoring functionality as a service, in a unified, easy-to-use interface. Low-cost SaaS deployment sacrifices granularity and throughput (no support for 40 Gbps platforms). AppNeta is a startup with limited revenue. AppNeta's weaker analytics capabilities prevent automated root cause analysis. This capability only functions in Layer 3 and Layer 4 versus Layer 7, the critical application layer. CA Technologies focuses on the broader IT operations management (ITOM) market and additionally on application delivery, service management, portfolio and project management, and security. With broad offerings in the availability and performance monitoring segment, the vendor has extensive coverage for network management and APM areas. The offering evaluated in this Magic Quadrant was CA Performance Management 2.3, which was complemented by several products from the NetQoS acquisition in 2009 and earlier CA acquisitions (e.g., Concord Communications). Deep packet inspection is done with a combination of CA Application Delivery Analysis (ADA), and a white-box OEM of JDSU-Network Instruments' GigaStor product known as CA GigaStor. CA ADA components are used as part of the APM offering, providing end-user experience monitoring and component latency measurement. The NPMD solution includes CA Network Flow Analysis and CA Unified Communications Monitor for voice and video monitoring. CA's new CEO was appointed in early 2013, and is attempting to dramatically change the way the vendor delivers products and solutions. With a focus on SaaS delivery and organic modernization of the product portfolio, many changes have already started to take place. CA has also embarked on a journey to become more agile, releasing software more frequently with public code drops, enabling customers to see progress quickly. The vendor's network monitoring capabilities are broad, but also show depth in the NPMD and APM markets, making them a good choice for a wide area of coverage. CA has demonstrated an ability to internally develop and enhance its monitoring offerings (including for NPMD), instead of relying solely on acquisitions. The vendor is transforming its network management and APM portfolio solution development model from a monolithic legacy software provider model to a more modern, quickly iterative SaaS delivery model. CA's pricing and product portfolio complexity are a concern for Gartner clients. Analytics integration lags competitive offerings, providing limited insight into collected data. Users report issues implementing and maintaining CA ADA technologies due to complexity. Corvil's focus traditionally has been in the high-frequency trading market, developing unique intellectual property to allow for accuracy, granularity, and distributed packet collection and analysis. The vendor refocused the offering in 2013 to bring enterprises onboard with several new product features and functions. The offering consists of CorvilNet 8.1, an appliance-based solution consisting of CorvilNet Engines for data acquisition and the Latency Management Center (LMC) for centralized administration and management of the appliances. The appliances analyze and decode the packet data, extracting default and user-defined metrics. Additionally, the product automatically does hop-by-hop latency measurement when deployed in a distributed manner. Packet data can be exported into standard packet capture file types. Fidelity of capture is high, with timing data coming from distributed deployments or from external time sources. CorvilNet now supports protocols used for storage, databases, Web services, voice over Internet Protocol (VoIP) and video. Automated correlation and easier autoconfiguration make the product easier to deploy versus prior offerings. The cost of the solution tends to be higher than other NPMD solutions. Corvil's product capabilities have been designed around the unique, demanding and relatively sophisticated financial vertical customer base, whose needs and resources may not match those of mainstream enterprises. Fluke Networks' heritage comes from Fluke's well-known network testing equipment for diagnostic purposes. Fluke and Fluke Networks are wholly owned subsidiaries of Danaher since 1998. Fluke Networks was spun out of Fluke in 2000, and its first product under the Fluke Networks brand was the OptiView network troubleshooting tool. Its offerings have expanded beyond that area, while still leveraging the large footprint it has for those products. Via acquisitions such as Visual Networks in 2006 and ClearSight Networks in 2009, the vendor's NPMD product portfolio has grown considerably, taking the best technology from each acquisition to form Fluke Networks Visual TruView. We evaluated Visual TruView 8.3 (an integrated offering) and Visual Performance Manager 8.3 (a scale-out offering leveraging Visual TruView), and additional data and configuration information comes from the handheld OptiView XG 11 product. Visual TruView is an integrated solution providing the ability to handle packet analysis, flow analysis and SNMP polling in a single offering. The Visual TruView appliances are sized differently, based on the storage and processing requirements of the network. The Visual Performance Manager provides views across multiple TruView appliances. OptiView XG provides an endpoint and additional data to Visual TruView, allowing for better troubleshooting data to be fed to the centralized analysis. Danaher is also the parent company of VSS Monitoring, a network packet broker (NPB) vendor, which it acquired in 2012, but no specific synergies have been announced at this time. Visual TruView is a single product offering and appliance line that allows the customer to repurpose and use each appliance for multiple types of data acquisition. The product is priced competitively. The product is easy to implement and use on a daily basis. The product line is new, and, with many changes still taking place, stability, long-term adoption and support are not yet proven. Danaher, the parent company, has done little to facilitate the sharing of technology between its acquired companies (VSS Monitoring, Arbor Networks, Tektronix and Fluke Networks), often resulting in each vendor creating overlapping technologies. Analytics and automated analysis of data are limited to baselining, providing less value for automated trouble detection and troubleshooting. From its inception in 2000 through today, Genie Networks has focused on providing network monitoring solutions for communications service providers (CSPs). However, attractive pricing and carrier-grade scalability have generated interest in the vendor from outside of the CSP industry as well. Based in Taiwan, Genie Networks' presence is strongest in the Asia/Pacific region, but it has recently also seen growth in Europe. Building from a competency in traditional SNMP-based network fault and performance monitoring capabilities, the vendor also incorporates deep packet inspection and flow analysis (uniquely including Border Gateway Protocol [BGP] routing analysis) into its current offering, GenieATM v.6.1.2. The appliance-based GenieATM solution includes several reporting templates designed for common CSP support use cases and supports GFlow (a proprietary protocol), alongside all standard flow types. Tight CSP and Asia/Pacific region prioritization compromises adoption beyond these focal points, although the vendor's international client base is growing. The product's user interface, while graphical and functional, is dated compared to more modern products. Analytics capabilities are basic and centered on automated baselining to support anomaly detection. One of the first vendors to offer enterprise network monitoring tools (many will be familiar with its OpenView heritage brand), HP has a long history of investment in this market, and both a substantial portfolio and customer base (particularly in the network fault management space) as a result. HP continues to maintain a strong market position; however, its customers have expressed concern to Gartner regarding shifts in HP focus, strategy and execution in recent years. Although HP is showing a renewed focus in this specific area, the newer, key technological capabilities are not yet fully built. A key component of HP's Business Service Management (BSM) offering, the NPMD solution is joined by Application Performance Monitoring, Event Correlation and Analysis, and other HP technologies to support many availability and performance monitoring needs. 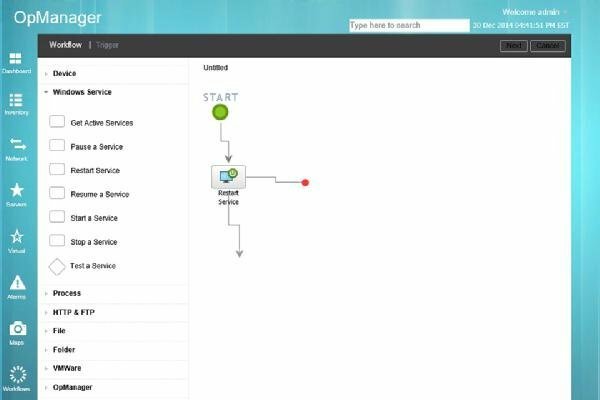 HP's NPMD solution is composed of several products based on and around its heritage SNMP-based fault and performance product, Network Node Manager i (NNMi) v.9.23, supplemented by Smart Plugins for Performance (adding flow collection, among other capabilities) and Advanced Services (adding unified communications visibility and other capabilities), as well as HP Real User Monitor (RUM) v.9.23 for deep packet inspection. There is an established network monitoring technology and customer ecosystem. Deep packet inspection is accomplished via RUM, which has not been tuned to specifically suit NPMD use cases. While InfoVista's primary focus has been to provide NPMD solutions for the telecom and carrier space, we evaluated 5View Service Data Manager v.3.3 for data consolidation off other appliances, such as 5View NetFlow v.6.2, 5View Applications v.5.1 for deep packet inspection, 5View Mediation v.5.1 for online analytical processing (OLAP) business intelligence reporting, 5View TeraCap for long-term packet storage, VistaInsight for Networks v.5.1 for polling data collection (including SNMP, WMI, CLI, XML, VMware and SMI-S data), and Vista360 v.2.2 for dashboarding and reporting. Some of these solutions will merit consideration for larger enterprises and government organizations. The products are designed for multitenancy and scalability to meet the demands of the CSP space, particularly in terms of providing the network service assurance component of open-source software (OSS) architectures. Application visibility and customer reporting are key elements of the solution, both of which are delivered by collecting traffic usage, application and network response time, and quality of service (QoS) metrics. 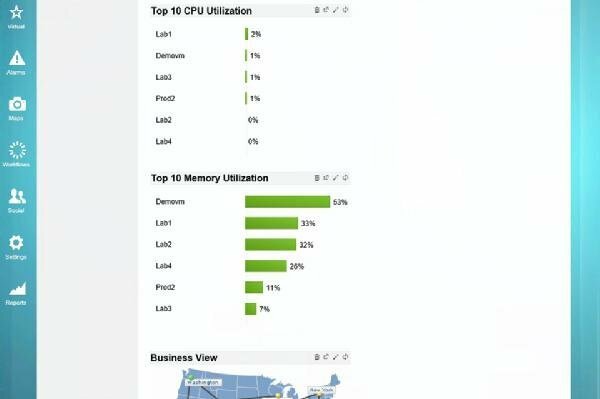 These metrics are consolidated from the 5View appliances into Vista360's repository for dashboarding and reporting of the data. Identification of degrading application performance and network traffic, as well as service-level management, are typical use cases for the deployment of the solution. Recent product updates have improved application visibility by providing flexible NetFlow support, in addition to already supporting Cisco's Network Based Application Recognition (NBAR), NBAR2, Application Visibility and Control (AVC) and various standard flow types. The ability to monitor end to end in large distributed carrier and mobile operator networks allows CSPs to gain application visibility. Multitenancy enables distributed external customer reporting. This not only will appeal to CSPs and managed service providers (MSPs), but also is increasingly important for large enterprises attempting to operate as internal service providers. The framework architecture enables the normalization of key performance indicator (KPI) data across multiple vendors and domains. A lack of lower-end packaged solutions marginalizes all but the largest of enterprises and government organizations. Deployments typically require greater levels of professional services engagement. The vendor lacks a significant presence in the U.S.
Network Instruments' acquisition by JDSU was not factored into this Magic Quadrant evaluation, as it occurred after the assessment cutoff. As indicated by its name, Network Instruments is a vendor with a singular focus on network monitoring solutions, which is reflected in its homegrown, vertically integrated technology development strategy. Established in 1994, Network Instruments has grown its portfolio from a Windows-based monitoring application to a full NPMD offering primarily composed of physical appliances. The vendor generates revenue through direct sales, partner channels and a significant OEM agreement. While Network Instruments has self-sufficiently funded its own growth over the bulk of its existence, in 2012, private equity firm Thoma Bravo took a controlling interest in the company. In the transaction, Network Instruments retained its leadership team, including co-founder and current CEO Douglas Smith, and, to date, the vendor has continued to grow its portfolio and customer base. Network Instruments' current NPMD solution is composed of Observer (v.16), Observer Reporting Server (v.16), GigaStor (v.16) and Observer Infrastructure (v.4). AppFlow protocol support is provided in addition to standard flow types. Network Instruments is fast to respond to customer and market demands, due to expertise in both hardware and software design. Packet capture and inspection (via GigaStor) capability is well-regarded; this product is repackaged and sold by CA. The NPMD solution requires multiple components with differing user interfaces that are not consistent across products, making learning the platform more of a challenge. Customers report no hardware warranty beyond four years, requiring new purchases to maintain hardware support (see Note 1). Founded in 2000, Lancope's StealthWatch System is focused toward security buying centers; however, the vendor has looked to provide NPMD coverage where opportunities to do so present themselves. Packet capture is conducted on demand in a standardized format to enable its consumption by third-party protocol analyzers. Likewise, StealthWatch FlowSensor enables the identification of applications and their performance metrics. The product enables easy exporting of flow records to external products. Lancope's recent StealthWatch System 6.4 includes a performance optimization feature for both flow and packet-based data collection. The StealthWatch FlowReplicator component provides the ability to estimate the number of flows per second that an environment is capable of, to assist in determining monitoring requirements. For packet capture, StealthWatch FlowSensor has improved its small-packet processing capabilities. Lancope has recently been added to Cisco's Global Price List, which should help it reach a wider customer base and gain greater exposure than was previously the case. Lancope's understanding of security-related incidents enables it to provide a greater understanding of how malware, network abuse and distributed denial of service (DDoS) attacks affect network performance than do traditional NPMD solutions. The vendor is an active thought leader on flow-based technology support, actively participating in industry and trade events to encourage the use of and development of flow-based technologies. Lancope offers strong data mining capabilities due to the NPMD solution being designed around OLAP concepts. Lancope's NPMD solution is comparatively more expensive than alternative offerings, due to it supporting both IT operations and security use cases. Due to the vendor's security focus, only a limited number of resources are dedicated to addressing NPMD feature requirements. Company size and growth in the security market make Lancope an acquisition target, which may de-emphasize the NPMD focus. NetScout Systems was founded in 1984 and has been a mainstay in the NPMD space ever since, providing network performance solutions across the enterprise, service provider and government markets. Since assuming the dominant position in the market, NetScout has combined internally grown technology with sound acquisitions to augment its existing portfolio and capabilities. Significant acquisitions include Network General in 2007 and a trio of acquisitions in 2011 (Simena, Fox Replay and Psytechnics), covering such areas as security, voice and video analytics, and network packet brokering technologies. The latest acquisition was of Accanto Systems, which helped enhance NetScout's voice monitoring capabilities. Earlier this year, NetScout consolidated much of its portfolio into the nGeniusONE 5.1 solution, which supersedes the outgoing nGenius Service Assurance Solution offering. It should be noted that there remain some elements of the previous platform that have yet to be incorporated into nGeniusONE, namely the nGenius Voice/Video Manager, although indications suggest this is a temporary situation that NetScout is looking to address. Given the coverage of the NetScout offering and its dual-market strategy of meeting the needs of both the enterprise and service provider markets, customers in those markets should find stability in a NetScout solution. The vendor has a sound acquisition history, with a track record of absorbing new technology into a unified NPMD platform. NetScout has a large market share in the NPMD market space, with a strong and loyal customer base. The patented Adaptive Session Intelligence technology allows the solution to scale toward the support of 40 GbE and 100 GbE environments, while optimizing storage requirements and enhancing the visibility of data. NetScout has a limited ability to expand beyond its network management heritage, which would be the next logical step (for example, into APM or IT operations analytics). Offering only a hardware-based deployment model limits NetScout's ability to address growing software and SaaS solution demand. NetScout is perceived as a conservative stalwart in the NPMD space, and lacks the reach and mind share that many smaller competitors have. Founded in 1997 and still led by its founder, Dr. Parag Pruthi, Niksun offers both network performance and security products. While offering appliances and architectures to suit network infrastructures of all sizes, the vendor recently released its Supreme Eagle platform, which supports high-fidelity data capture and analytics at speeds of up to 100G. Niksun has, to date, focused on ISP and other highly network-dependent industries, but has increasingly found itself being evaluated by enterprises of all types due to its highly scalable design. The vendor's current NPMD solution consists of NetVCR (for line-rate packet capture and analytics) and NetOmni for centralized management of products running the Niksun Alpine 4.4. Up to 100G packet capture and analysis support in recent releases makes Niksun one of the first to reach these speeds. The vendor has been an innovator in the space by introducing new features before competitors. Niksun's NPMD solution has a highly scalable design, supporting high traffic capture rates. Niksun's NPMD solution is designed to support both NPMD and security use cases, but is not optimized for either use case. Market presence and messaging are limited and outdated. The user interface is dated, making usability and learning more difficult. Headquartered in Paris, Orsyp has become an increasingly active participant in the NPMD space. This involvement is rooted in QoS-oriented deep packet inspection capabilities that were developed internally. However, two recent acquisitions — Sysload in 2009 and Streamcore in 2012 — have expanded the original feature set. The two technologies complemented Orsyp's existing deep packet inspection heritage well. Sysload 5.60 provides performance and endpoint monitoring capabilities, while Streamcore 6.1 adds WAN optimization and network performance monitoring. Recent feature inclusions are the ability to deliver NetFlow collectors and the management console as virtual appliances, as well as the enhancement of overall NetFlow collection and reporting. The solution can support network links up to 1 Gbps and uses agents that run on and gather data from endpoints, storing the collected records locally before pushing them to a central repository on a 24-hour cycle. Since the acquisition of Streamcore, Orsyp has since concentrated on bringing its acquired technology sets together into a unified offering to address the NPMD space, and this is evident with a well-designed and intuitive single user interface. Complementary technologies have been consolidated to provide a well-rounded overall solution, including the ability to not only monitor, but also affect the QoS and application delivery. 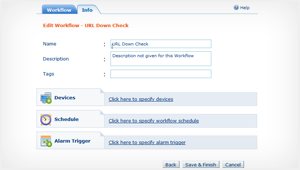 The user interface captures typical operator workflows well, including troubleshooting and optimization use cases. Orsyp's NPMD solution is priced attractively, considering its capabilities beyond monitoring needs. Appliance options are limited, and cannot currently scale past 1 Gbps; 10 Gbps support is expected in mid-2014, but there are no immediate plans to support 40 Gbps or 100 Gbps. While Orsyp conducts business globally, it has not yet broadly expanded its NPMD installed base outside of EMEA. Paessler focuses on offering network monitoring software, with a unified offering called PRTG Network Monitor. The tool has a broad set of capabilities, including agentless server monitoring, network fault monitoring, flow monitoring and packet sniffer technology to determine application usage. The solution is priced very attractively, based on the number of monitors set up in the product, and is available via a try-before-you-buy go-to-market strategy. While, the NetFlow monitoring sensor can ingest all standard flow type technologies, the product does not yet support custom IPFIX templates. This easy-access try-before-you-buy solution offers a simple, low-cost option. PRTG Network Monitor covers monitoring of network elements for fault, flow analysis, and packet sniffing with a single simple solution. Additionally, the product supports health monitoring of application instances, servers and virtual environments. Simple clustering allows for fault-tolerant monitoring easily, without complex clustering software or third-party technology. The Packet Sniffer module has limited capabilities, including a finite ability to save packet data to disk and fewer supported application types than other market entrants. Paessler focuses on selling via Web and resale channels. The product is often implemented in parts of environments, versus being an enterprise standard. Scalability has yet to be proven, with no known deployments over 100,000 configured monitors (devices typically require multiple monitors). Riverbed focuses on application delivery, acceleration and performance monitoring. During the past four years, Riverbed has built the popular Cascade product suite, composed of several acquisitions, including Mazu Networks and Cace Technologies. The vendor has taken a large leap into the performance monitoring space with the Opnet Technologies acquisition, which closed in early 2013 to form the Riverbed Performance Management (RPM) offerings. The products span both NPMD and APM technologies, composed of Cascade Profiler 10.5 for flow analysis and analytics; Opnet AppResponse Xpert 8.6 for deep packet inspection, including end-user experience monitoring and application visibility; Cascade Shark and Cascade Pilot 10.5, which together perform more simplistic deep packet inspection packet capture and analysis; Opnet AppTransaction Xpert 17.0, which provides application transaction tracing and analysis; Opnet AppSensor Xpert 2.0, which collects SNMP and other agentless performance data; Opnet AppResponse Xpert BrowserMetrix 2.2, providing a true end-user experience monitoring capability from the browser perspective; Opnet Unified Communications Xpert 4.1.2, focusing on unified communications management supporting components from Avaya and Cisco; and, finally, the offering is brought together with RPM Dashboards 2.2 for rollup visibility and reporting across the NPMD and APM products. The solution includes several appliance lines and software components, but provides technology support and depth often not matched by other solutions. The solution supports packet inspection, storage and advanced analysis of collected data. AppFlow, NetStream and Cascade Flow (a proprietary protocol) support is provided, in addition to standard flow types. Riverbed's NPMD market offering includes analytics both in a distributed and centralized manner, creating a high degree of usefulness from the captured data for troubleshooting, capacity planning and monitoring. The depth offered in the Riverbed solution is often cited as the differentiator in the offerings; technologists appreciate this detail and the strong analytics across the offerings. The ability to see deep into Citrix, voice and other distributed applications from the network and application instrumentation perspective (APM) makes Riverbed a vendor with broad performance monitoring offerings. The RPM offerings include a fragmented and complex set of hardware and software technologies, which need more software and user interface integration work to improve consistency and ease of use. The solution is priced at a premium. Product line and naming changes prior to and between acquisitions have created confusion. Founded in 2005 by a serial entrepreneur and a technologist, SevOne has had rapid growth and secured $150 million in venture funding from Bain Capital in January 2013. This represented one of the largest venture financings of the year and the largest in the history of the NPMD market. Management changes followed the investment and their implications have yet to be fully realized. The vendor had initially targeted larger enterprises that were well-suited to leverage the peer-to-peer-based appliance platform. SevOne boast support for 200,000 objects from a single appliance. While maintaining its position as one of the fastest and most scalable NPMD solutions remains a priority for SevOne, it has limited depth into packet data. The vendor is building a targeted strategy to address the needs of the midmarket going forward. The recent 5.3 version of the Performance Appliance Solution was released in August 2013 and helped enhance the solution's usability and workflow interface, to appeal to both large enterprise and midmarket customers. The scalable and distributable peer-to-peer architecture lends itself well to a "buy as you grow" deployment approach. A rapid flow analysis engine enables the highest-reported flows and polling instances on a single appliance. The vendor has significant financial backing and interest from a key venture capital firm, coupled with strong marketing. Management changes have yet to be fully realized, including new senior management and board members. SevOne relies heavily on third-party repackaged technologies to provide deep packet inspection capabilities, which are critical to a holistic NPMD solution; however, the customer deals directly with SevOne. Analytics are largely based around the concept of baselining and are more limited than other NPMD offerings. None; this Magic Quadrant is in its first release. Network endpoints — Servers, virtual machines, storage systems or anything with an IP address by measuring these components directly in combination with a network perspective. Network components — Routers, switches and other network devices. Predictive behaviors by leveraging IT operations analytics technologies — The ability to distill and create actionable advice from the large dataset collected across the fourth requirement. 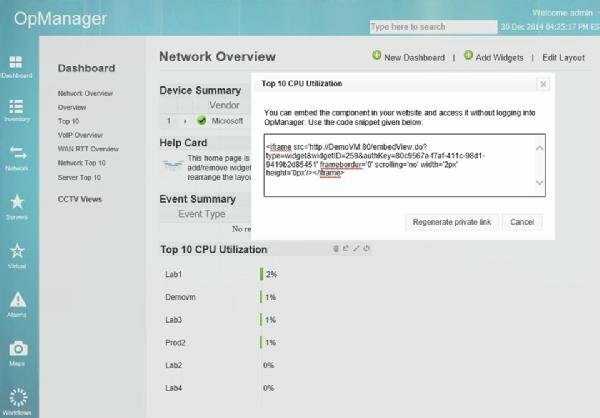 Network-device-generated data, including NetFlow, sFlow, JFlow and IPFIX flow-based data sources. Customer references must be located in at least two of the following geographic locations: North America, South America, EMEA and/or the Asia/Pacific region/Japan. The vendor should have at least 50 customers that use its NPMD product actively in a production environment. The product must have been shipping to end-user clients for production deployment and designated with general availability by November 2013. Offering (Product) Strategy: We evaluate product scalability, usability, functionality and delivery model innovation. We also evaluate the innovation related to the delivery of products and services. The Leaders quadrant represents those vendors that are pushing the NPMD market forward, including those with comprehensive portfolios and the ability to handle multiple application and technology types. They offer a choice of hardware or software appliances for optimum flexibility. Additionally, the use of SaaS delivery methods within portfolios gives enterprise IT teams more choices, while making formerly premium priced NPMD solutions attainable by midsize organizations. Challengers consist of those with high market reach and large deployments. Once leaders in the network performance monitoring market, they are currently struggling to deal with new technical demands and rising expectations. These established NPMD vendors bring a substantial installed base, but also architectures, feature sets and pricing structures that require modernization (often in progress) to better compete with those in the Leaders quadrant. Visionaries have built a compelling plan to competitively address current and future NPMD customer demands. The Visionaries are combining elements of APM and NPMD in ways that provide deeper visibility than is currently available from other vendors. Currently, execution is limited either by limited market reach or the extension of existing tools and technologies not initially designed to meet these needs. Niche Players are those with solutions catering to specific audiences or with limited use case support today. They have often been unable to address the needs of larger enterprises or have only done so within specific verticals or market segments. Each of these vendors is working to appeal to the broader NPMD buying community, versus the targeted use cases they serve today. With the right changes to their product plans, positioning and/or business execution strategies, any of these vendors could successfully shift their differentiated technologies to address use cases in ways that today's Leaders might have a hard time matching. NPMD solutions should be considered as part of a larger network management initiative — as part of an overall availability and performance monitoring strategy. Utilizing these additional points of reference will yield additional unique criteria (existing investments, investment plans, vendor relationships, etc.) that, when combined with Gartner analysis, can prove critical to proper solution selection. Ease of use remains an area of needed improvement and varies significantly both across vendors and within solutions. Both IT operations analytics vision and execution are lacking in most NPMD solutions. On-premises appliances are the dominant delivery model, but software and SaaS offerings are available. Integrations with other ITOM solutions (even other availability and performance solutions) are an afterthought for most solutions, thus encouraging the use of these tools within the network silo. It remains imperative that organizations purchase tools that closely match their current maturity levels. It is a current reality that many network monitoring teams have yet to successfully make the leap from basic, reactive network availability management to proactive performance management. While tool investment can play a part in this maturation, it is clear that simply investing in NPMD tooling without similar investments in training, integration and processes will yield limited results at best. Gartner recommends that network teams assess their current state of maturity on a regular basis, both individually and at the organizational level, to provide this perspective. To help, teams can utilize Gartner's ITScore for infrastructure and operations (I&O; ITSIO) (see "How to Improve I&O Maturity by Using the ITScore"). Organizations should not utilize the Leaders quadrant as an effective shortlist of appropriate vendors, but instead should build a list of criteria that describe their current and future needs, and then select from vendors that best meet those requirements. Organizations should select a vendor that has both a history of and future plans for focusing on this market. Careful consideration should be given to required skills, training, process and deployment investments, because these factors will have a much greater impact on the overall value realized from an NPMD investment than any specific functional capability found in a given tool. Each of these shifts has pressured network teams to rethink their tooling strategy, so that they can get the visibility they need to truly monitor and troubleshoot the performance of their network resources in the context of the applications and services they support. A subset of the overall network performance monitoring market, NPMD has emerged as a unique market designed to address these very needs in today's increasingly complex environments. A fast-growing subsegment, the NPMD tool market is currently estimated by Gartner to be approximately $1 billion in size. Period polling is one method that looks to quantify network usage of network elements to gauge the requirements of the infrastructure. Each network device has embedded agents that "speak SNMP." These agents can then be interrogated with a polling-based approach, returning metrics from the embedded agent. These collected metrics can be stored, reported on, analyzed for troubleshooting or used for capacity planning. SNMP polling can also be used to gather hardware or software errors (faults) and capacity data (for example, triggering an alert when a hardware fault occurs, the device CPU is above a threshold or the interface capacity is abnormal when compared to a baseline) Based on the metrics gathered, the network team can estimate the delta between existing and required bandwidth needs on a per-location basis. A limitation with this method is the minimal granularity it offers, which matches the frequency of the polling. In most NPMD technologies, SNMP is used during troubleshooting to collect additional data, whereas in availability monitoring, it's used more regularly to understand the health of the network devices. Summarized data is generated by the network devices, which includes characteristics of the IP conversation between two network nodes, and these characteristics are embedded within flows. Flow data is exported from the network devices to the NPMD technologies, which then collect and process this data stream to provide insight into which devices and applications are consuming bandwidth, how long the conversations are lasting, and who is participating in them. Since the data is summarized, a degree of detail is removed to simplify processing and extract meaning from the actual network data. Flow-based data does not provide details down to a specific set of network packets going between the source and destination, and can have a performance impact on the devices exporting flow data. There are several flow collection standards, such as Cisco's NetFlow (v.5/v.9), Juniper's JFlow, Huawei's NetStream, Citrix's AppFlow, Riverbed's Cascade Flow, the Internet Engineering Task Force's (IETF's) IPFIX (which is based off NetFlow v.9) and sFlow from the sFlow.org consortium. Vendor-derived standards are predominant, which hinders integration and comparisons. 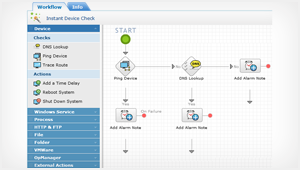 Flow data collection is a function embedded in the network devices themselves. The device analyzes the network traffic traversing from one interface to another, with the primary purpose of assessing bandwidth consumption, and the level of data being sent and received between various source and destination ports across the network. That data is then summarized into a stream of flow records that is sent to the monitoring tools that collect and assess the flow records. Additionally, the quality and granularity of flow information are always evolving. Many vendors embed additional data within their flows, especially those implementing flexible record types, such as Cisco's IOS Flexible NetFlow, which allows the user to configure the exported data format. Example data embedded in flows contains wireless protocols, link aggregation, URLs, latency information, and other application or infrastructure monitoring data. With such open standards in flow technologies, the implementation varies between network equipment vendors, but most tools collect and process the data regardless of the network equipment implementation. As the NPMD market continues to grow and develop, Gartner expects that future tool enhancements will center on usability, advanced IT operations analytics and virtualization/SDN support (see "Introducing the Network Performance Monitoring and Diagnostics Market"). Additional vendors are expected to enter the NPMD market, as well as over 30 vendors participating in the larger network performance monitoring market, but they did not meet the criteria specific to the 2014 NPMD Magic Quadrant (see "Criteria for the New Magic Quadrant for Network Performance Monitoring and Diagnostics"). A wholly contained subset of NPMD, application-aware network performance monitoring is a necessary maturation step that adds some degree of application visibility accomplished via packet-based monitoring, which can provide varying degrees of application context to monitored network traffic. APM tracks the end-user performance of application components, and provides granular troubleshooting tools for the application and its components. It provides this insight by monitoring on five main functional dimensions, including: end-user experience monitoring (EUM), application topology discovery and visualization, user-defined transaction profiling, application component deep dive, and IT operations analytics. APM differs from NPMD primarily in its focus on monitoring the quality of the end-user's experience via application interactions across all application and infrastructure tiers, including, but not limited to, the network perspective. NPBs assist with traffic aggregation, visibility and overall management of the data being sent to monitoring tools. Vendors in the NPB space often partner and team up with NPMD and security vendors as a go-to-market strategy, resulting in marketing messages that can make it difficult to determine which tool is actually performing the monitoring (network performance monitoring or security) and which is facilitating the monitoring by managing the data to be monitored (network packet brokering). We have also seen an increasing number of acquisitions in this space. NetScout and Network Instruments, both of which are in this Magic Quadrant, pair NPBs and NPMD tools together in deals. Other popular NPB vendors include Gigamon, Ixia (Anue and Net Optics), VSS Monitoring, NetScout, JDSU-Network Instruments, Interface Masters Technologies, Apcon, Datacom, and switch provider Arista Networks. Unified monitoring is a subset of infrastructure monitoring that relies on primarily agentless and API-integration-based data collection methods to monitor the availability of servers, networks, storage and virtualization layers. These tools also do minimal discovery, and acquire physical, virtual and logical topologies and the relationships between them for the purposes of monitoring. They monitor common application instances on OSs, perform synthetic transactions for checking Web application availability, and support service and infrastructure grouping, and are multitenant by design. Unified monitoring differs from NPMD primarily in its pure focus on infrastructure availability versus NPMD's focus on performance. Unified monitoring should be supplemented by log analytics, NPMD and APM tooling to support complex troubleshooting and performance monitoring.